(Editor’s note: While September 19th is Speak Like A Pirate Day, any day is a good day to do so if you are talking about Alestorm) Avast there me hearties! ‘tis time to sail the briny blue in search of treasure, wenches and adventure! Wait, strike that, wenches first, treasure second. Me likes me wenches! Now you scurvy dogs, run up the Jolly Roger and crank this album to 11! That be the best way to repel boarders. Alestorm be a band what plays that very best of kinds of songs, pirate metal. Before ye laugh, read on and see why ye ought to be listenin’ to this band of merry Scots rogues. 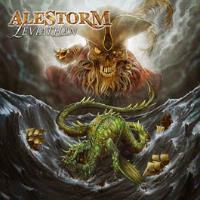 Leviathan is indeed a four song EP that bridges the plank, err, gap between Alestorm’s maiden voyage and second albums. While the disc be only a short shore leave to the lands of piratical head banging and merriment, it contains nothing but treasures and not a curse among ‘em. Alestorm’s crew be made up of Captain Christopher Bowes, giving orders in the strongest of voice. First mate Dani Evans, who wields his six-string like a sword. Gareth Murdock, upon ye bass and drummer Ian Wilson who together keep time to spur on the rowers. The merry metallic sound of this band of brigands will charm even the most ardent landlubber into crewing with Alestorm. This be an epic length tale of a creature of the deep. All pirates should keep a weather eye for said beastie, lest it drag yer ships to Davy Jones’ locker. Captain Bowes sings the tale of this monster whilst using his nimble fingers upon the keys. It’s a hard rocking reel sure to cause ye to head bang with the crew. The two things a pirate craves more than treasure! This be a new version of Alestorm’s own barroom ballad, “Wenches and Mead” sung here in German! There just be something so right and ribald about a band of Scots pirates singing a drinking song in German. Ich bin ein pirat! All hands on deck to sail the seven seas of metal! Available a year ago as naught but a ghostly digital only song, this disc be the first bit of shine to hold Alestorm’s glorious call to arms. Furious double kick drums spur sailors onward in the chorus whilst a merry accordion riff does well to blend the worlds of pirates and metal. Aye, if ye have read this far, then seeking adventure with salty pirates ye be. Arrgh then it be time for ye to join the crew of Alestorm, matey!